Our silk jewelry rolls also feature a large inside pocket and a ring holder that buttons into place. Once filled, the entire pouch can be rolled into a compact size and secured with the attached tassels that have adorable silk lotus blossoms at each end. 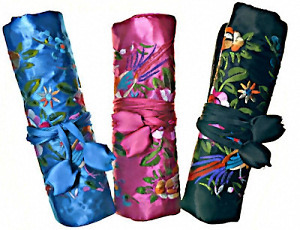 When open, the jewelry roll measures approximately 6" by 9". These elegant silk pouches make lovely gifts for wedding attendants or anyone special whom you know would appreciate a little luxury! *Please note: Our current stock of silk jewelry rolls are a bit smaller than the ones we usually carry. 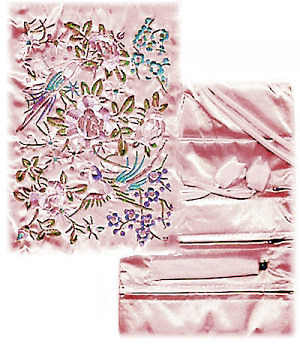 Most LongLocks designs created with bone hair sticks will fit in these pretty little brocade pouches. LongLocks RapunzelStix or very long SwingStix will not completely fit if inserted horzontally in the pockets. COLOR AVAILABILITY: Our jewelry rolls are currently available only in chocolate. Please note that fabric and brocade patterns may vary slightly from the image above.